Readers have selected which carry-on bag they'd choose for a first meeting with their beau's family. Their tastes vary, but I'm sure yours do too. Now it's time for you to weigh in! Which one is your favorite? Put your vote in the comments section, and the person whose choice gets the most votes will win a free pair of silver Diba "Back Down" wedge sandals (pictured below). Here are pictures of their choices, along with their comments.The winner will be selected on Friday, so I hope the entrants spread the word! Barbara: "My must-have carry on bag would be this Floto Imports Positano Grande Leather Duffel with a drop-down bottom for, what else, shoes & sundries)- a classic bag that would last through many adventures." Lauryn M: "Black, sleek, Victorinox luggage sends the right message every time. AND it wont get dirty...you know the airlines could care less about your luggage...so this Victorinox Werks Travler is for me." Chocl8fashnista: I'd rock them! Because the shoe is so outlandish, the rest of the ensemble needs to be simple, Skinny denim, white tank, asymmetrical shoulder padded blazer (or simple black blazer), minimal accessories and the shoe should take center stage. I wear (and get away with, i think) weird things, so theses shoes suit me. 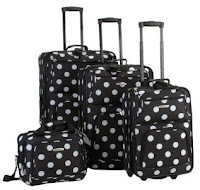 xoxo I'd pair them with the carry on pieces from this Rockland Set in Black Dots. I need to make a statement! Lauren: Picture this... Silver wedge heels, dark washed skinny jeans, silver chain belt, grey off-the-shoulder silk top with some chunky purple bangles. To top off this funky yet sophisticated look, I would sport the Titan Luggage 360 Four Diamond Edition 22" USA Carry-On, with it's diamond-pattern exterior it's sure to get heads turning! MJ: I would pick this luxe Siamond Cappuccini Leather Carry-On. My mind boggles at the idea of a guy even knowing what shoes I was wearing when meeting his family, let alone picking them out for me! But I love those wedges, and I'd wear them with dark grey jeans and a taupe top, probably drapey and possibly ruched. Big silver earrings, too. Or a chunky silver statement necklace, of course. 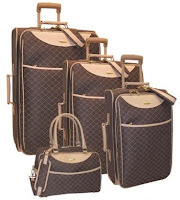 Vittoria: Without a doubt, i'd tote the carry-on pieces from this Pierre Cardin Signature Series set. It looks like a long-lost Louis Vuitton pattern! I'd be turning heads left and right...everyone would think a celebrity was strutting past with those statement shoes, a hot boyfriend, and that great luggage set! my vote is for vittoria! 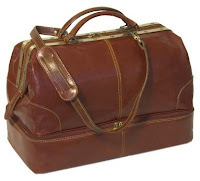 My vote is for Floto Imports Positano Grande Leather Duffel! Hotness. I vote for Barbara's duffel. I'm all about the carry-on. i vote for vittoria's print pattern..posh!